Just wanted to let those who have posted here in the past about the cost of registration for tours like the recent National one that was on the West Coast. I got a check in the mail today for over $100. as a refund! This is not the first time I've got refund checks from tours. I don't expect a refund but its got to be very hard to guestimate the total costs. Here's a link to a very nice set of pictures from the recent Redwood Trees to Pacific Seas tour. Now if you look at the scenery we had I have to ask, How can you put a price on such a wonderful time we had with our Model T's and Friends with scenery like that? Thanks for the Memories REMTC! thanks for the links. Really wanted to do that tour as my first after many years as a club member. Just did not work out this year. Have been on those roads many times in both vintage and modern cars, and agree the scenery is fantastic. Last time I did Hwy 1 was in a Ferrari 308 2010, hoping to do it in the 22 coupe next summer. Maybe the redwood club will offer another tour. I got my check today too. Thank you Redwood club. I just did my first tour - the Richmond National - I had a blast driving one of the trouble trucks ! Some tours are very inexpensive except for the lodging. I'm a camper and rarely stay in a motel, so the lodging is less of a consideration for me. I got a check too. The Redwood Empire club hosted a great tour and took good care of business also. Hosting a tour is the same from the local chapter up to the national level. It's not about money, it's about model T's and those who enjoy them! Hats off to the Redwood Empire club for doing it so well. This has already passed but there is next year. The tour was in a beautiful area. Contact is poorboytour@model-a-ford.com. Hotel room, meals, etc. are not included in the zero cost. Like Steve said, it's not the tour per se, but the stinking hotels! Unfortunately, I'm a wimp so camping is out for me, unless it's in a nice air conditioned "RV". So it really limits what I can afford to do in any given year. Such is life. So I tour a lot around my area..plenty of unseen roads yet to explore, and the ones I've been on still are nice to see over again. Guess I'm a home-body. I have yet to make my first "overnight" tour event with my new "rig", but hope to do that on an upcoming 3-day Labor Day weekend event that my club will have at that time. Last year, I purchased a 27' vee-nose enclosed car hauler trailer in which I have installed very basic and compact living quarters in the vee-nose end of the trailer. Complete with 12 volt battery/solar and 110 volt generator or "shore power" electric, interior lighting, heat, air conditioning, microwave, porta-potty, convertible bunk beds, etc, etc, I hope to make overnight and/or out of state tours considerably more affordable. My thought is that with toilet facilities, and the ability to eat, sleep and cook independently of restaurants and motels, I can save something in excess of at least $100.00 per night. On the tours I go on I see huge motor homes towing a two car trailer, with shop. Of course, with these guys, money is not too much of an obstacle, so they still stay in the hotels. 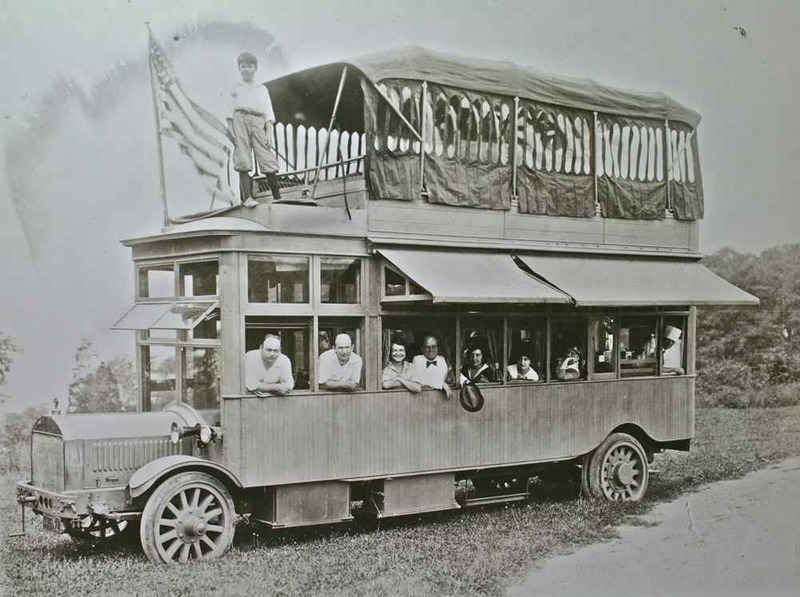 Some day, when I have the money, space, and time, I would like to build a small motor home on a Model T chassis. Not the one below. Neil - is the Poor Boy tour usually a spoke tour out of a single location or a loop with a different stop each night? Just received my Check. Fantastic well planned tour. Visiting the northern most California Mission was just one of the many highlights for me. Driving on "the" PCH (Pacific Coast Highway) was another for my wife. Best of All being with Friends. Priceless. 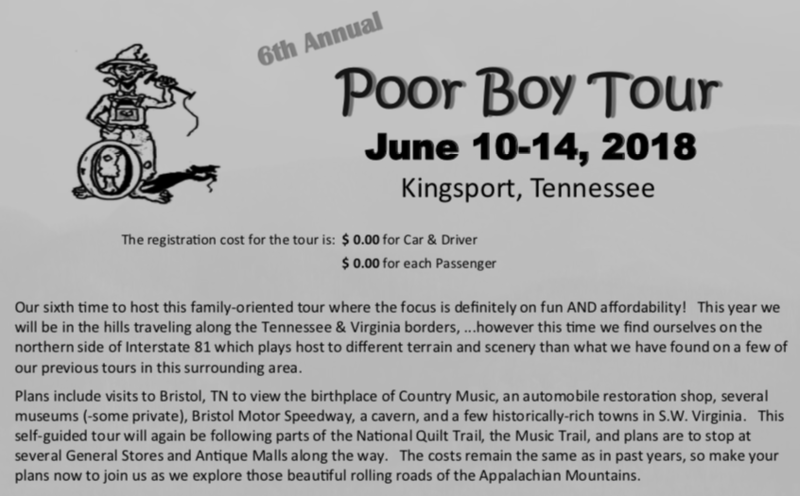 Poor Boy tour is a spoke tour. I received a check today and sent it back . I got my money�s worth on the tour. It was a great tour and they were great hosts. I had a great time and would definitely go back if they have another one. Thanks for sharing the link to those great Tour pictures. Even a few pics of your nice Torpedo in there! Organising, budgeting and running a National tour is a huge project. Only those who have done it truly appreciate the work involved! Having done it, I truly appreciate those who do it. Well done to the team who put this tour together and being able to supply a refund. My only problem is I wasn't able to be on it! Thank you Neil, that format is more convenient for those of us who prefer to stay in our motor homes rather than motels. We kind of like out own bed and food choices. I look forward to what that tour looks like next year as we have some family in Kansas and Tennessee that we haven't seen for a few years. Walt -- I believe that next year's MTFCA National Tour will be hosted by the Tennessee T's.